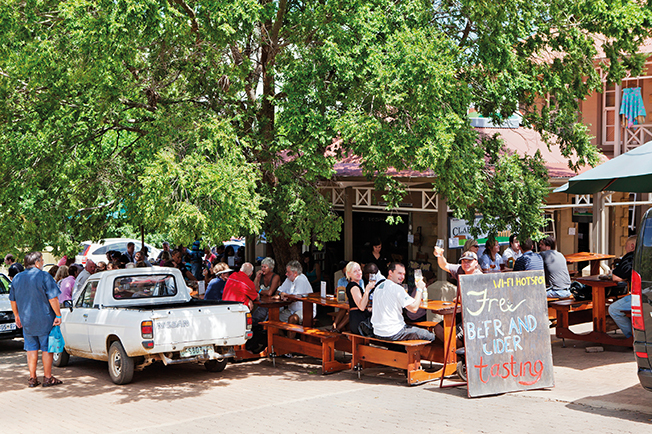 Flanked by the Maluti Mountains, the arty town of Clarens is known as the Jewel of the Free State for its quaint buildings, tree-lined streets and breathtaking setting. Clarens is South Africa’s original artists’ town, having long attracted painters with its poplar trees and stunning mountains, which seem as though they belong in a French Impressionist landscape. One such artist is personable former Rhodesian Richard Rennie, who arrived in 1990 and now sells moody semi-abstract landscapes in his gallery on Main Street. There are enough galleries and boutiques for a day of browsing, with a smorgasbord of bric-a-brac, books, CDs and wine offered for sale alongside the canvases and sculptures. Look out for Clarens Gallery, which juxtaposes Middle Eastern rugs with watercolours and oils from closer to home. These outdoor enthusiasts add some adrenalin to the slow country pace, offering a range of activities on the gnarly local rapids and rocks. 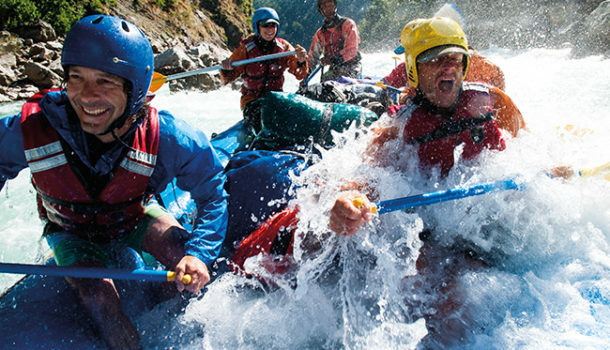 At the top of the list is white-water rafting on the Ash River, one of South Africa’s best rafting spots, with grade three and four rapids, scenic riverbanks and plenty of bird life. Alternatively, reach for the heavens on the two 150m-long zip lines or the 50m abseil from a sandstone rock overlooking town. Also on offer are mountain-bike tours and rentals, putt-putt, paintballing, archery, quad biking and day trips to Lesotho’s mountain villages. The on-site cafe, cocktail bar and deck are ideal for recovering after tackling the Ash. One of SA’s most serene parks, Golden Gate Highlands is named for the golden hue of its sandstone cliffs, especially the dramatic Brandwag Buttress formation. 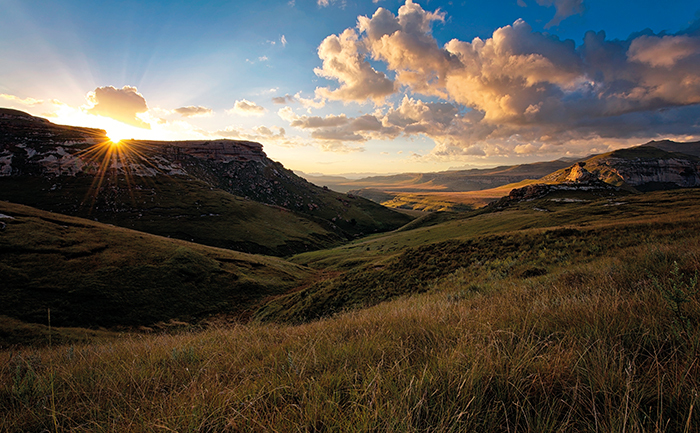 An easy 25 km east of Clarens, in the foothills of the Maluti Mountains, the park with its shimmering grasslands is spectacular at sunset. 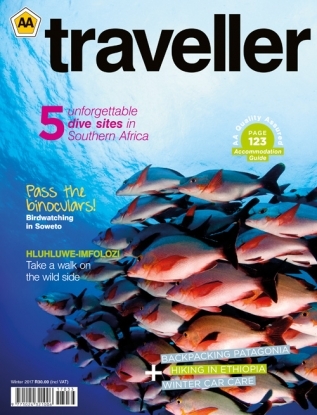 It offers the rare opportunity to hike in a national park without a guide, plus animals (which include various antelope species, Burchell’s zebras and jackals). The walking trails extend from short meanders to the 28 km Ribbok Hiking Trail, where sightings of rare bearded vultures, bald ibises and black eagles are possible. There are guided tours of the Basotho Cultural Village and scenic self-drive loops off the R712, the main road through the park. True to its setting in the rugged Eastern Free State Highlands, Clarens is itself surrounded by various interesting rock formations. Two local landmarks are the hefty Titanic Rock, which overlooks the entrance to town, and the precarious-looking Mushroom Rock, just outside Clarens on Clifton Farms. From the turn-off to the Second Boer War site Surrender Hill, towards Fouriesburg on the R711, a 30-minute walk leads to the Motouleng fertility caves. In a narrow river valley with beautiful rock formations, sangomas live in traditional huts below the southern hemisphere’s largest cliff overhang. Traditional healers as well as herbalists visit this sacred site, which holds a San burial ground. Pay a small fee and ask consent to enter the caves, where you can light a candle and drink from the sacred spring. Clarens Xtreme Adventures offers a half-day guided tour. 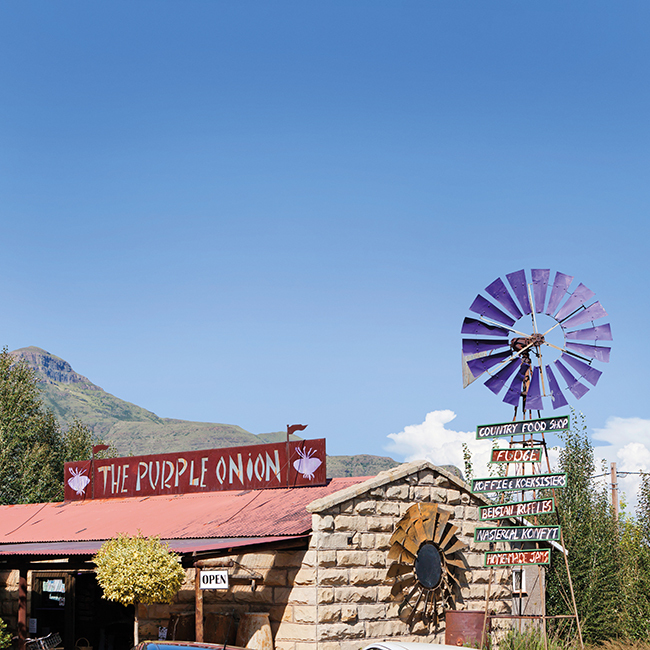 On Groenhoek Guest Farm, 12 km east of Clarens, Elsa Buys, a winner of the KykNet cooking programme Kokkedoor, serves delectable food in a quirky setting of corrugated-iron walls and pumpkins. The trip is well worth it to sample her platters and burgers, along with views of the Brandwag Buttress formation. Book ahead for the Harvest Table, a brimming Sunday buffet. With a retro interior and glorious views of the Maluti Mountains from its deck, this much-loved Italian eatery has just recently broadened its menu. Now – in addition to a good selection of pizzas, pastas and vegetarian options – a very satisfying wine menu and some house specialities, including beef curry and oxtail stew, are on offer. Commendable service and the location on the main square add to Vito’s appeal. Only three hours’ drive from Joburg, the comforts of Born Free Lodge in The Clarens Golf Estate await. The en-suite rooms, which can accommodate up to eight in total, are well appointed with everything you might need. For when it’s chilly outside – and winters can get very cold – the underfloor heating will keep you as cosy as ever, and the air conditioning is welcome in summer. Secure parking is available. Take a relaxing stroll to the village, play a round of golf or use the lodge as a base from which to explore the surrounding mountains and attractions. With its four self-catering apartments, The Clarens Country House is perfect for a romantic getaway, or for a group holiday of up to 10 friends or family members. Tucked away in a wooded part of the secure Clarens Golf Estate, it offers stunning uninterrupted views of the surrounding Maluti mountains. Originally a stone shed, the building dates back over 100 years. It has been beautifully renovated and decorated, with the works of Herman Charles Bosman as a theme. A short walk will take you to the village square, with its restaurants, shops and art galleries. On the estate itself, guests can play 18 holes or relax and enjoy an in-house spa treatment. Also nearby, you’ll find the local craft brewery and a selection of exciting adventure activities.